The following information was taken from Wikipedia. Pulham St Mary is a village in Norfolk, approximately 7 miles (11 km) east of Diss and 18 miles (29 km) south of Norwich. It covers an area of 12.26 km2 (4.73 sq mi) and had a population of 866 in 365 households as of the 2001 census, the population increasing to 892 at the 2011 Census. It is a small village and part of "The Pulhams" which also includes Pulham Market. The church, dedicated to St. Mary the Virgin, is believed to date from around 1258. 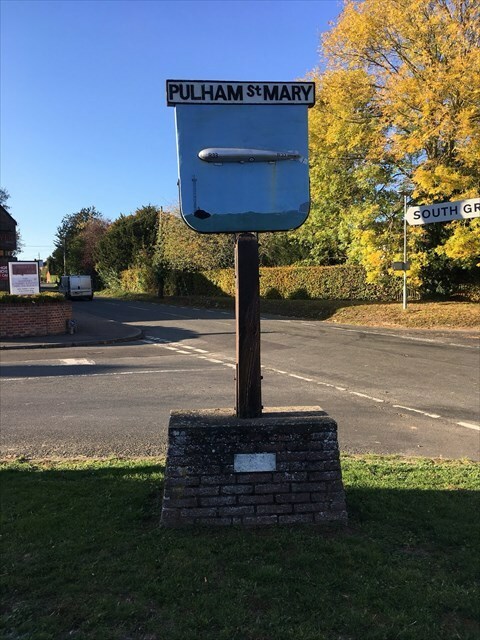 The name Pulham is thought to mean the farmhouse or enclosure by the pools or streams. The earliest recorded spelling is Polleham. The Romans may have had a settlement in Pulham St Mary as pieces of Roman tile, coin and oyster shells have been found in the area. The village was well known in medieval times as a centre for hat-making, and the ancient Guild of St James the Lesser established the Guild Chapel, now in the centre of the village, as part of Pennoyer's school. Pulham St Mary railway station was a stop on the Waveney Valley Line which closed in 1953. The village was struck by an F0/T1 tornado on 23 November 1981, as part of the record-breaking nationwide tornado outbreak on that day. Another tornado had earlier struck the nearby village of Pulham Market. In 1912 under conditions of secrecy a large base, RNAS Pulham, was constructed for the operation of airships. The airships were locally given the nickname of "Pulham Pigs". RNAS Pulham operated as a Royal Navy base until 1918 when it was transferred to the new Royal Air Force. In 1917 two large steel-framed sheds were erected and in 1919 a 120-foot (37 m)-high mooring mast joined them. Following its historic both-way Atlantic crossing the R34 returned to Pulham Market. The large rigid airships R33, R36 and R38 also visited. The base's airship hangar was dismantled in 1928 and re-erected at Cardington. In the early 1920s there was a radio Direction finding station was located here, that helped give accurate position reports to aircraft operating into Croydon airport. The base became disused in the early 1930s after the crash of the R101 when all work stopped in Britain on airships, although it continued as an RAF property until 1958. During World War II it was a dump for crashed aircraft from all over the east of England; parts were salvaged for reuse. Munitions testing was also conducted on the site. There is plenty of off parking available off the main road very close by. The cache is located in a busy location so stealth will be required although it should be an easy find. Tweezers recommended.